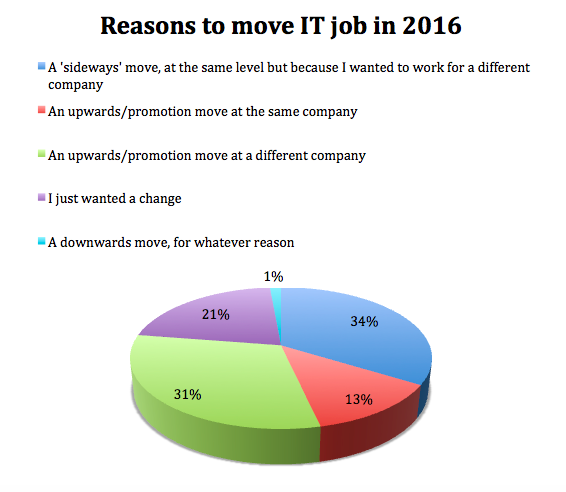 My last blog article covered the numbers moving jobs last year in IT (55%) and the numbers who intend to do so in 2016 (53%). This time, I’m looking at what our research* told us about the reasons behind these job moves. Not applicable (i.e. didn’t move in 2015 or not wanting to move in 2016). 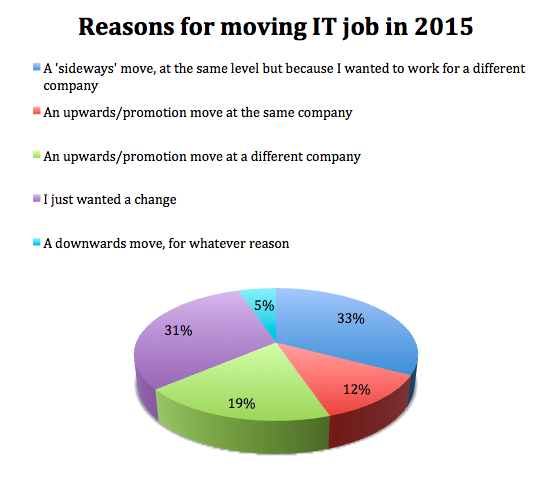 For those who moved jobs in 2015, the principal reasons were “a sideways move at the same level because I wanted to work for a different company” (33%) and “because I wanted a change”(31%). Those seeking promotion were more inclined to move to get it (19%) than those who would seek it at their current employer (12%), while, perhaps unsurprisingly, those who would accept a move downwards were in a substantial minority (5%). Even allowing for a margin of error, these figures can be taken to imply a considerable weight of opinion that says “I want to change company as well as change job.” Nearly two-thirds of our sample (64%) wanted “a change” or a sideways move to a different company. Add in those (19%) who want a promotion to a different company and you have an overwhelming indication that people are not remotely bound to their current employer. When we look at the reasons why people think they want to move job in 2016, a similar pattern emerges in some areas but not others. Those who wish a ‘sideways’ move to a different company are, at 34%, virtually the same proportion (33%) as those who moved for this reason in 2015. Those who want to gain a promotion at their present company are, at 13%, almost identical again to those (12%) who moved for this reason last year. In contrast, those who ‘just want a change’ in 2016 are at a considerably lower level (21%) than in 2015 (31%), and those who are seeking a promotion elsewhere in 2016 are far more numerous (31%) than those (19%) who actually made such a move in 2015. This last finding probably tells us that expectations are not always borne out by reality! In the case of those who ‘just want a change’, without conducting individual interviews it’s hard to say why, but experience would suggest that this may be due to the fact that as the year progresses an increasing number of IT employees become disillusioned and seek pastures new? What these data undoubtedly do suggest is that a lot of people want a new job in 2016. For Be-IT, as recruiters, that’s good news. For our clients, as businesses trying to manage their staff numbers and keep projects on track, it’s potentially anything but. Even allowing for a margin of error, these figures ought to be a wake-up call to HR teams and line managers to get out amongst their colleagues and create the most favourable working environments they can – otherwise, when we repeat this next year, a lot more people will have found some greener grass outside the confines of their current workplace. * This research was carried out by an independent third party, using Be-IT’s database of over 2,500 individuals, our consultants’ extensive Linkedin contacts and a complementary social media campaign.